JuryImages.com is a free unique tool for artists applying to art shows. It helps answer the two most asked questions artists have about their application; which images should I use and what order should I arrange them in. Artists can set up a free account, upload their jury images, move them around and create different combinations to compare the strength of their jury presentation. Check out the web site for more information. Kevin Kaye's booth at the Rochester Hills show. 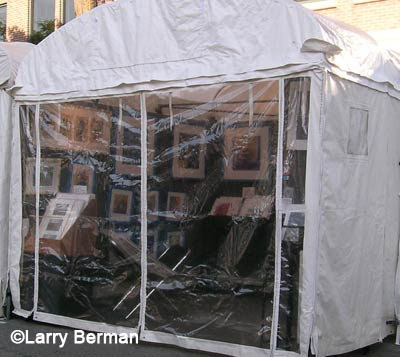 Photo by Jan Robb.A humorous look at why you shouldn't shoot a booth slide at an art show. The Images Festival of the Arts in New Smyrna Beach Florida has taken it upon themselves to redefine how to size digital jury images. Totally ignoring the fact that over 30,000 artists have jury images sized 1920x1920 on their computer, they are asking for images sized 6x8 inches at 300PPI which translates to 1800x2400 pixels. The problem with asking for non square images is that verticals display at 3/4 of the size that horizontals display because that's the format of monitors and digital projectors. And if the jurors are using wide screen monitors, the size difference between horizontals and verticals can be even greater. Read my post about how not to ask for digital jury images, or just read the Images application. The photography requirements for the Bar Harbor, Maine show on ZAPP which closes next week. Has anyone ever actually destroyed their master file, which is very short sighted because that eliminates any chance of putting together a body of work to be published in the future, like in a book. True limited-edition photography of high quality. *Note about photography: Because of the spread of digital and other "mass produced" means, photography does not fall under the guidelines for original, one-of-a-kind or true limited edition art. However, due to "popular demand" it has been decided to allow photography to be exhibited provided the artist certifies that the image will be part of a true limited edition. In other words, a provenance must be included with each individual image certifying that the image will be reproduced in only a limited number edition of 250 or less after which the creator/master files will be destroyed. 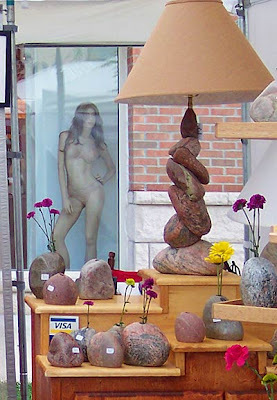 How to display and sell your work while at a show, and a whole lot more! Additionally ZAPP has agreed to set a one day fee of $70 for our seminar. Both Bruce Baker and I will be giving away our services as door prizes. And as usual when I do a seminar, I'll be there early to answer questions for anyone ambitious enough to get there early also. 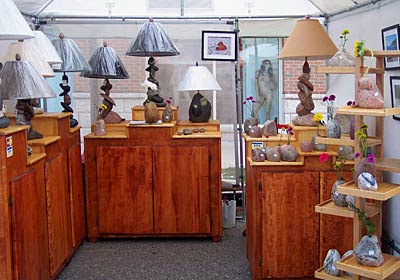 Main Street section of the Michigan Guild show from 2006. The last year I did Ann Arbor. My booth behind the clear front I had made for my Craft Hut. Each morning before the show opened I would take down the inner opaque side so people walking around early could see my work and hopefully come back to purchase. 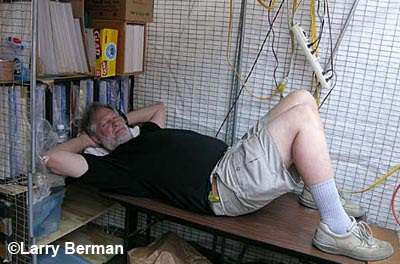 That's me sleeping behind my booth during a slow time while my wife watched the front. 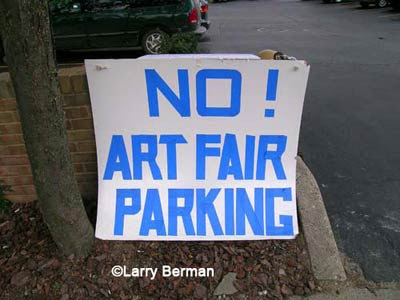 Typical sign found on the streets of Ann Arborduring the art show. On the positive side of the art show news, this year the Three Rivers Arts Festival in Pittsburgh (my local show) changed the length from three weeks to two weeks this year for the first time. I walked the show both weeks and spoke to over a hundred artists. Most artists said that they were doing well. An additional layout change was to move the Friday, Saturday, Sunday spaces down to the point and they turned the food booths around to face the forty booth spaces that were located there. Everyone's first impression was that the spaces wouldn't work do to the separation from the rest of the show in Gateway Center on the other side of the Hilton. But it turned out that most of the artists in the new location did well there and some first weekend artists even requested to come back for the second weekend if space became available due to cancellations. 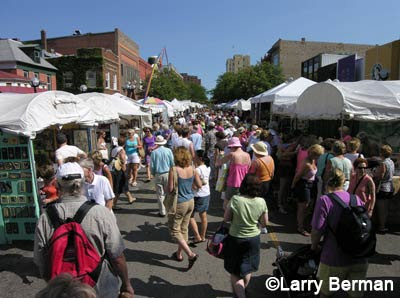 It's exciting to see that kind of change in an arts festival that's been around so long. I hope they keep the length of the show to two weeks from now on.